Written by Lawrence D. Alter and published by LDA Enterprises, Ltd., our job search guide helps you get and keep your next job. 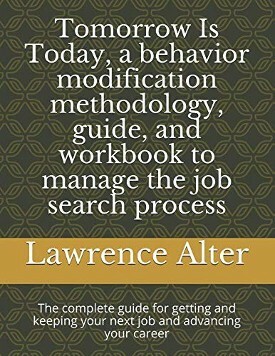 In it, you will find a behavior modification methodology, guide, and workbook that will help you effectively manage the job search process. It is estimated that 1 out of 3 workers attempts to change jobs each year in the United States. That represents almost 50,000,000 job seekers, either employed or unemployed, who are seeking new employment annually. Because of today's highly competitive job market, it is not uncommon for over 200 people to respond to advertised openings. To further complicate matters, less than 15% of all job seekers find a new opportunity through online postings. As a result, the job search is often a very lengthy, emotional, and frustrating experience. Both USA Today and The Wall Street Journal have highlighted the fact that only about 13% of all professionals find a new position through published openings (combining online and print media), 10% through utilizing the services of placement agencies or search firms, and a mere 5% through direct mailings. Why then, would anyone focus over 90% of their time and effort in areas that represent only about 30% of all the potential opportunities? Examples of Cover Letters, Interview Follow-Up Letters, Letters to Third-Party Organizations, etc. Mr. Alter is a veteran sales/marketing executive and an established leader in the outplacement and career management industry. He has over 35 years of experience successfully guiding thousands of professionals in achieving both their career and compensation goals. His marketing methods have proven valuable in assisting people at all levels generate new and meaningful employment, start a consulting practice or business enterprise, better manage an existing employment situation, or deal with the politics related to internal career growth. He has been equally effective in helping new college graduates who are about to launch their careers, mid-level managers on the way up, senior executives striving for a greater challenge, professionals in the non-profit world, and those in their 50s or 60s who may be in the twilight of their careers. His clients have included a wide variety of business professionals, retired military officers, educators, educational administrators, and executives in the non-profit community. Additionally, he is a veteran mediator in facilitating negotiated solutions to critical business and personality issues. He is an expert advisor and tactician at assisting in the negotiation of compensation packages and achieving equity opportunities and is astute at assessment and strategy relating to the start-up or purchase of a business enterprise. He has successfully developed and managed the efforts of three major Midwest-based career management firms and is the founder and Chief Executive Officer of LDA Enterprises, an outplacement and career management firm focusing on career development, reference verification, and resume/motivational letter services for professionals in transition. Mr. Alter is an acclaimed industry expert whose advice has been quoted in various publications including Fortune Magazine, the Minneapolis Tribune, the Chicago Sun-Times, the Milwaukee Journal Sentinel, the Tampa Florida Tribune, the Houston Chronicle, and numerous online periodicals. His own column, the "EmploymentClinic" appeared for several years in the CareerBuilder section of Minnesota's second-largest newsprint publication, The St. Paul Pioneer Press. Previously, he served as both Regional and National Sales Manager for several consumer products manufacturing companies.